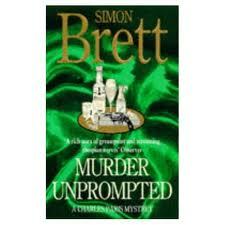 Simon Brett, Murder Unprompted (1982) I could have chosen almost any one of the Charles Paris mysteries. This is one I happened to have on the shelf. They are all acutely observed and very funny. What an old reprobate Charles is, with his fondness for Bell’s whisky and his roving eye, yet his heart is the right place and he never quite loses the reader’s sympathy. In Murder Unprompted it seems he might at last hit the big time when he is the second lead in a play that transfers to the West End. Then the star is shot on stage . . .
Helen McCloy, Cue for Murder(1942). At the end of Act I of a revival of Fedora, a rare hoary old melodrama, it transpires that the corpse on stage really is a corpse and only the one of the three actors on stage could have been the killer. It’s up to McCloy’s psychiatrist sleuth Basil Willing to unravel the mystery. The theatrical setting is brilliantly evoked. 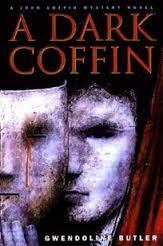 Gwendoline Butler, A Dark Coffin (1995). I suspect that Butler, who died in 2013, is not much read now and if so that’s a pity. She combined crime and the macabre in a quite original way. The series featuring John Coffin began in the late 1950s. By the time she reached A Dark Coffin he is a very senior policeman happily married at last to Stella Pinero, an actress in whose theatre two people are found stabbed to death in a box at the end of the performance. Butler wrote shortish novels, not a word wasted and all the better for that: very suspenseful, very good. Glen David Gold, Carter Beats the Devil (2009). Charles Carter is a stage magician who is given his stage name “Carter the Great” by Houdini.The novel begins in 1923 with the most daring performance of Carter’s life. Two hours later US President Harding is dead and Carter flees the country, pursued by the Secret Service. This is one of those long densely written novels that you don’t want to end. Lots of fascinating stuff about the art of the stage magician. A great read. Donna Leon, Death at La Fenice (1992). The first in her Venetian series, which have given me a lot of pleasure over the years. The audience are waiting for the third act of La Traviata to begin, when the artistic director appears between the curtains to ask ‘Is there a doctor in the audience?’ But Maestra Wellauer, poisoned by cyanide in his coffee, is beyond medical help. When Commissario Guido Brunetti investigates he finds that the man had plenty of enemies. Combines one of my favourite cities with one of my favourite settings. Penelope Fitzgerald, At Freddie’s (1982). Freddie’s is a stage school for children and Freddie herself is an institution and something of a monster: ‘she knew she was one of those few people in every walk of life, whom society has mysteriously decided to support at all costs.’ It’s set against a production of Shakespeare’s King John. Fitzgerald herself described her subject as ‘The courage of those who are born to be defeated, the weaknesses of the strong and the tragedy of misunderstandings and missed opportunities which I have done my best to treat as comedy, for otherwise how can we manage to bear it.’ It is both funny and profound. 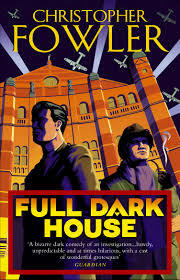 Christopher Fowler, Full Dark House (2003). I am a fan of Christopher Fowler’s Bryant and May series. This was the first and it begins with an explosion at the Peculiar Crimes Unit. John May mourns the death of his old friend Arthur Bryant. It seems to have something to do with their very first case in 1940 during the Blitz. It began when a dancer is found dead – and minus her feet – in the Palace Theatre, which turns out to be a very sinister place indeed. Sarah Rayne’s Ghost Song (2009) is set in the vividly realised Tarleton theatre on London’s Bankside and is another crime novel that moves between the past and present. I love all the details of the old music hall shows, the terrific creepiness of the old theatre at night, and the on-the-edge-of your-seat suspense. Ngaio Marsh, Opening Night (1951). Marsh is the doyenne of the theatrical mystery. She was made a dame for her contribution to the theatre in New Zealand. This is an usual crime novel in that the murder and the arrival of Alleyn don’t take place until well over half-way through. It’s a decent mystery, but the main appeal is the superbly realised theatrical setting. Margery Allingham, Dancers in Mourning (1937). Reading this, I realised all over again what an excellent writer she is, so good at the way people think and behave. Chloe Pye, a dancer almost over the hill, has died. Her sister-in-law says: ‘ “. . . she was a good girl, I’m sure – at least her family always thought so, and now that time to be charitable if ever, when the poor soul’s lying dead.” This perfunctory dismissal . . . had the ruthlessness of a pronouncement of Time itself, and the more sensitive of them shivered a little. Arch, inviting Chloe Pye was dead indeed. It was like the drawer closing on a last year’s hat.’ Quite brilliant. The setting is a production of a musical comedy and Campion falls in love with the wife of the chief suspect. That’s it. It is always such a treat getting together with Moira in this way – and I have had a lovely time rereading some old favourites. Do over to Moira’s blog at http://clothesinbooks.blogspot.co.uk and see what she has chosen. When people hear that I write crime fiction, they often ask me ‘who’s your favourite crime writer?’ Immediately my mind goes blank. ‘Ruth Rendell? P. D. James? Ian Rankin?’ they prompt, taking pity on me. Well, yes, great writers, who have beguiled many a weary hour for me, but . . . By this time, I have thought of someone, ‘Andrea Camilleri . . .’ I murmur. ‘Donna Leon? Colin Cotterill . . .’ and then it’s sometimes their turn to look blank. Of course there are plenty of others whose work I enjoy, but I have to be in the mood. With these writers I am always in the mood. I buy their books as soon as they go into paperback – sometimes before – and I confidently toss their books into my suitcase when it’s time to go on holiday. Or else I save them for a time when I need a treat. All three writers have things in common. Their novels are relatively quick reads, they are witty and playful, they have vividly realised settings, and they feature great characters. I love Camilleri’s Inspector Montalbana and his long-suffering girlfriend, Livia, Leon’s uxorious Inspector Brunetti, and Cotterill’s Dr Siri. Colin Cotterill is relatively new on the scene and once again he was recommended to me by Richard Reynolds. The first was THE CORONER’S LUNCH – great title – and launched the career of Dr Siri, the elderly and reluctant coroner – actually the only coroner – in 1970s Laos. Cotterill’s novels are funny, full of fascinating local and historical details and, like Camilleri and Leon, he writes with heart. Cotterill won the CWA Dagger in the Library last year and it was well-deserved. He’s got a good web-site, too, colincotterill.com, well worth checking out.